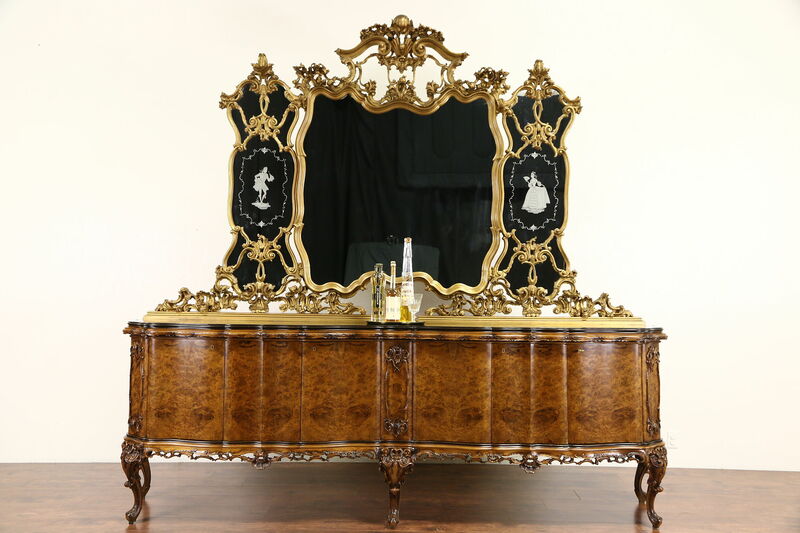 A spectacular Italian 1930's sideboard or server with gold mirror was carved in the Baroque manner. Gracefully curving, the walnut and burl has an excellent renewed finish. There are shrinkage separations from age, see photos. The two piece black glass top has reverse gold painting and minor chips and scratches. Below are locking doors wiht shelves and drawers. There are touchups to the original gold finish on the palatial mirror, which is reverse etched. Measurements are 9' 8" wide, 25" deep, the base is 40" tall and overall height is 8' 11."